My sister and I found the photo a few days after Mom’s funeral. While cleaning out her dressing room and closet, we counted twenty-two bed jackets in a variety of pastel shades, more Dacron and cotton bed jackets than skirts, slacks, or even blouses. We commented, yet again, on how sad and cheated we felt that for her final fifteen years our mother had been a shadow of her former self. Once we had cleared the clothing rods, we began pulling things down from the shelves. A few handbags. The sewing basket we had given her decades before, a gift that had, perhaps thoughtlessly, highlighted how much she hated to sew. Boxes of memorabilia. Her mother’s 1902 wedding book with a list of engagement and wedding gifts. 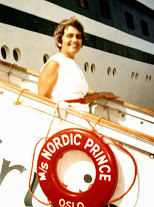 And then, in a box of photographs, there was Mom—Bert—smiling at us from the gangplank of the M/S Nordic Prince. We handed the photo back and forth, then rushed to show Dad. Mother wore a white sleeveless dress that showed off her tanned arms, matching white earrings, and a red belt. Her white teeth gleamed in a natural smile that we hadn’t seen since the stroke. Her dark hair was windblown and her hazel eyes partially shut against the sun. Dad guessed that the shot was from their trip to Scandinavia when Mom was in her early- to mid-50s. What a contrast to the oil portrait that hung in my parents’ living room. Dad had hired a respected Atlanta artist to paint Mother’s portrait to go with those of her mother, grandmother, and great-great grandmother. A nice gesture, it was a letdown from my perspective. The artist portrayed her as he saw her: an invalid. Whereas her ancestors’ eyes suggest depth, hers—similar in shape and color—lack vitality. Their portraits express spirit; hers, passivity. Her inherited spirit also showed in a childhood photograph I saw at my grandmother’s home. Mom, limited as her speech was in the first year of her illness, managed to convey to me that she wanted me to go in her stead to Seattle for her mother’s 98th birthday. Tearfully, I agreed. Granny and I spent the first day of that visit leafing through scrapbooks together. She paused at a black and white photograph of Bert, clothed in a simple dress, standing beside her bicycle. Like a bird interrupted in flight, the long-haired girl seems eager to resume her ride. “She was always so active,” sighed Granny, still seeing the lively ten-year-old locked inside her sixty-eight-year-old daughter’s hemiplegic body. No wonder my sister, Dad, and I seized on that cruise photo so eagerly. Like the bicycle shot, it captures the Bert who was always on the go. It shows the mother who took my sisters and me and our friends to the circus, the state fair, and the ice follies every year. Who wrote silly poems for our birthdays. Who helped me with my Latin homework. Who worked jigsaw puzzles with me and gave me sponge baths when I was sick. Who started reading to my firstborn when I was sure he was much too young. Who attended a book club meeting with me and, though she had not read the book, impressed my friends with her vigorous participation. This Bert attended League of Women Voters meetings and helped form the National Council of Jewish Women’s Golden Age Employment Service. She chatted with friends, played golf, shopped, entertained, and arranged flowers. This vivacious woman, who stood happily on the ship’s gangplank and now smiles at me from a frame on my dresser, is my real mother, the mother I lost fifteen years before her body died. She is the one I miss. I sighed in recognition when I read your post. I have 3 pictures of Chana on my living room window ledge: the first was soon after marriage, the second one on a cruise we took about 20 years ago, and the third one from about a month before she died. memories can be a blessing if they bring us further peace of mind and heart. judging from the assortment of bed jackets you found in her closest, i gather her style stayed with her even though her body did not. to me, that said she did not give up easily, still maintained her dignity and grace. we use what we can and when we can, the perseverance of the human spirit. you, b.j. are a perfect example of that. may you continue to have that strength with whatever comes your way. How great that photos have been able to bring back happier memories of your Mom. You can think of her as pretty and vivacious. I recently wrote a letter of forgiveness to my mother (who passed away 45 years ago), and I was able to summon up some happy memories to balance out the bad time when she was drinking. I wish I had had more time with her to try to understand her. And all I have from my biological mother, at present, is her name, Elva Smith, and her birth and death dates! This is so beautiful, and universal. Thank you.